Kona Historical Society's H.N. 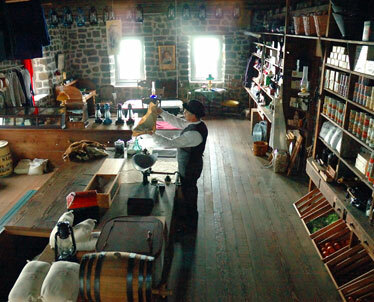 Greenwell Store, originally built in 1875, was restored 16 years ago as a living-history museum. This month, Maile Melrose turns the pages of her cookbook to her favorite recipe for plum pudding, an original concoction by her great-grandmother Elizabeth Caroline Greenwell. It takes Melrose all day to make a big batch of the rich fragrant treat full of raisins, dates, nuts, currants, citron, lemon and orange peels, cloves, nutmeg, allspice, cinnamon, brandy, sherry and chopped suet. Note: Thirty-minute store tours are available 9 a.m. to 3 p.m. Mondays through Fridays, except holidays. Cost is $7 for adults and $3 for ages 5 through 12. The store represents the first phase of the Kona Historical Society's Kalukalu Homestead Ranch and Store project. When completed in about five years, the project will present a typical 1890s Kona ranching homestead. To be constructed on three acres are a main house, a butter house, saddle house, laborer's house, blacksmith's shed, privies and laundry facilities. This series of special events will take place at the H.N. Greenwell Store during the holiday season, Nov. 26 through Dec. 21. » From 10 a.m. to 2 p.m. Thursdays during this period, there will be a demonstration of bread baking in the Portuguese Christmas tradition. All activities listed below include admission to a holiday-themed living history program, which begins Nov. 26. » Nov. 29: "An English Christmas in the Hawaiian Kingdom," from 5:30 to 7:40 p.m., will feature music and light refreshments reflecting a late 19th-century holiday celebration. Free. » Dec.1: On the half-hour, from 10 a.m. to 2 p.m., Maile Melrose will give presentations about her great-grandmother Elizabeth Caroline Greenwell, who came to Kona in 1868 as a young bride, raised 10 children and ran the family store and ranch. Cost is $7 per person and $3 for ages 5 through 12. » Dec. 5: Floral artist Scott Seymour will help participants create an old English arrangement, Hawaiian style, using fresh island foliage, 10 a.m. to 2 p.m. Cost is $40 and includes materials and a light lunch. » Dec. 21: Make a Victorian Christmas card, ornament or silhouette with artist Tomas Villa, 10 a.m. to 2 p.m. Costs $7 per person and $3 for children, including materials. Melrose, a resident of Kealakekua on the Big Island, packs the pudding into molds with buttered lids and steams it for six hours. She then cools it, sprinkles it with more alcohol and ages it in a cool, dark place until Christmas Eve. The dramatic presentation of her flambéed plum pudding is the highlight of the family feast she prepares that night. "Candles are flickering on the dining room table, but no other lights are on when the pudding is carried in," said Melrose. "My father makes sure there's a sprig of holly on top of it. Sometimes the holly catches on fire and causes even more excitement!" Yuletide festivities in Melrose's home echo the lavish celebrations of British immigrants like her great-grandparents, who settled in the area in the mid- to late 1800s. They decorated their houses with ohia, macadamia and tsugi cedar Christmas trees, and draped lacy asparagus fern over their paintings and lanai railings to imitate the greenery of the old country. In joyous camaraderie they savored hearty meals featuring roast beef, turkey and suckling pig; raised their glasses for many a toast to the queen and England; sang carols; and listened to hymns played on the piano by the ladies. THIS YEAR the H.N. Greenwell Store will revive some of these customs during a series of special events called "An English Christmas in the Hawaiian Kingdom" (see sidebar). Elizabeth Caroline's husband, Henry Nicholas (H.N. ), built the 1,000-square-foot store in Kealakekua from lava rock and lime mortar around 1875. It doubled as the community's post office, and customers flocked there to pick up their mail, necessities, niceties and the latest gossip. The Kona Historical Society came up with the idea of restoring the store as a living-history museum 16 years ago. Melrose was one of six researchers charged with piecing together its history, a task that, working intermittently, took them five years to complete. "We reviewed old receipts, correspondence and tax, probate and court records at the Hawaii State Archives and Bishop Museum's archives in Honolulu to determine what kinds of goods the store sold," she said. "We also considered the kinds of industries that were here at the time, the population mix and what their needs were." At the Kona Historical Society's Christmas at Kalukalu event, "An English Christmas in the Hawaiian Kingdom," Maile Melrose (left), great-granddaughter of H.N. 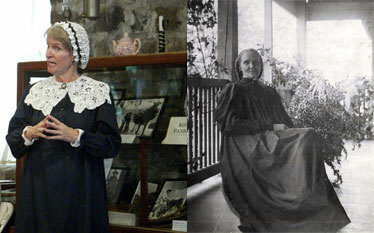 Greenwell Store founders Henry Nicholas and Elizabeth Caroline Greenwell (right), dresses as her great-grandmother and gives a first-person performance. Ads in the Pacific Commercial Advertiser newspaper also yielded clues about merchandise and the companies that manufactured them. KHS volunteers made or acquired the appropriate boxes, barrels, bags, crates, tin cans and other packaging materials; re-created labels for the items from samples from the Smithsonian Institution and similar 19th-century general stores on the mainland; and placed the wares on shelves and in cabinets just as they would've been displayed more than a century ago. Amazingly, renovations and exhibit setups were finished in a year. Opened in January, the store provides fascinating glimpses of what everyday life was like for ranchers, farmers and their families in upcountry Kona in the late 1800s. For the three-week "An English Christmas in the Hawaiian Kingdom" program, it will be gaily decked out for the holidays. Among other things, ladies' hats will be embellished with ostrich feathers; extra lace and ribbons will adorn party dresses; toys such as marbles, jacks, wooden train sets and rag dolls with porcelain faces will fill some shelves; and there will be a Christmas tree festooned with paper chains, fruit and candy. Lighted lanterns and candles will add to the atmosphere of revelry and good cheer. "Step into the store and you'll be immersed in the holiday spirit," Melrose said. "There's something magical about an old-fashioned Christmas -- especially in Hawaii!"